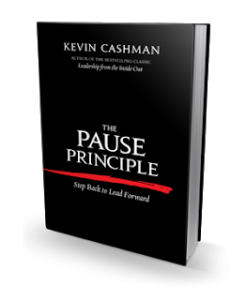 Review The Pause Principle Step Back to Lead Forward by Kevin Cashman. Whatever path you choose, you will eventually hit a wall. Artists and writers know these obstacles and they call them “blocks.” Our natural inclination when we’re being blocked is to push against, to assault, to throw all our weight against these perceived barriers. But successful artists, and it turns out successful innovators in all fields share a very different approach. Recently I read a book that actually did what it promised it could do. It aided me in discovering an entirely different paradigm for my focus on my website, A Day On. The Pause Principle: Step Back to Lead Forward (Kevin Cashman: Berrett-Koehler Publishers) suggests that in these days of more and more information, spoken and unspoken mandates to constantly “step up,” demands to bring nothing less than our A game, that there not only is value in pausing, but that the pause is the key to unlocking doors to potential that would ordinarily remained closed to those who relentlessly charge at them. The Pause Principle amounts to a kind of professional and personal Aikido; the ability to go against what our intellect might tell us to do and redirect energy, let go of our impulse to control and get into Life’s “flow” a bit to discover surprisingly bountiful outcomes. The book’s most obvious audience is business leaders who, lest we (and they) forget, are not automatons but people: passionate, human, stretched thin etc. They too want to rise above the bottom line and they want to inspire and achieve both personally and professionally. In The Pause Principle, Cashman asserts that the most effective and visionary of leaders integrate what he calls “Pause” into their lives and in doing so are inspired and emboldened to move themselves, their people, their companies and their society not only onward but upward. We keep finding more tools and technology to squeeze ever more information and demands into the 24 hours we are given each day. We are constantly being asked or asking how we can “Step up and achieve more.” But Cashman’s book illustrates that throughout time, truly great leaders have honored and taken part in acts of pausing and stepping back rather than constantly advancing and stepping up. These innovators have somehow inately understood that breaks from the action are essential to make the innovative and genius leaps forward that they are now known for. Innovators seem to understand that beautiful music requires the space between the notes as much as the notes themselves. It is a common expectation to feel in life and in work that we must be constantly moving forward in a measurable manner. And, while Cashman doesn’t discount hard work, he does emphasize the importance of knowing when to slow down, stop to ask good questions rather than feeling that we must always provide the right answer. And the epiphany that the book provided me was that A Day On when looked at in terms of Pause – does not necessitate that the taker of A Day On jump ship; he might just as well return to work energized. However, and this is a big “however,” the integration and acceptance of Pause in the modern workplace would require that not only CEO’s embrace the value of Pause, but Human Resource department leaders do so as well. Is pause allowed in your organization? I think of initiatives such as ROWE: Results Only Work Environments that seem to be moving in this direction. Reintroducing Pause back into our work life (because for the artisan it was and still is there) means reintroducing a piece of humanity back into the work place. And when the workplace was moved out of the home and shop and into the factory and office building much of that humanity was methodically stripped away. For example, I remember once looking longingly out the window of my cubicles office at the smokers gathered near the doorway. I remember actually considering taking up smoking just to get the smoke breaks. In the wacky upside down world of corporate America an office worker must inhale carcinogens just to have a “legitimate” reason to stand outside and… well, pause. Over a decade ago, in his book: Iron John: A Book About Men, author Robert Bly describes how the hero in the midst of his quest suddenly falls into a deep hole. He cannot go on with his adventures and as Bly writes: He made the earth beneath his feet quite smooth. He paced, he thought, he surrendered into himself and at last he was free to return to the earth and continue his quest. Bly explained that, like his hero we either need to “go down” (pause) on our own or we will certainly be pulled down at the most inopportune moments. Then, if we fight to return to our busy lives we will only sink deeper into our depressions. I cringe when our leaders insist, seemingly without much pause, that: “We have to get this economy moving again.” Cashman describes the wisdom of understanding Pause thus: “Finding the sweet spot of management effectiveness. Know when to step forward and when to step back.” We can only hope our business and political leaders are not advocating jumping right back onto the treadmill that brought us to this precipice, but that they themselves have paused to let themselves become inspired to innovate. Rick Ortiz’s blog, A Day On (https://www.adayon.com) describes the trials and tribulations of seeking work life balance.